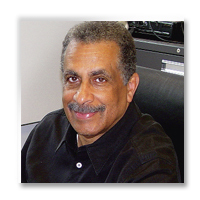 Professor Watkins has held research or faculty appointments at Sandia National Laboratories, Lawrence Livermore National Laboratory, Naval Research Laboratory, National Governors Association, NASA Goddard Space Flight Center, Naval Surface Warfare Center, U. S. Department of Energy, and Howard University. He is a Fellow of the American Society of Mechanical Engineers, a Fellow of the American Association for the Advancement of Science, an Associate Fellow of the American Institute of Aeronautics and Astronautics, and a licensed Professional Engineer. Brown, A.R., C. Morning and C.B. Watkins, “Influence Of African American Engineering Student Perceptions Of Campus Climate On Graduation Rates,” Journal of Engineering Education, April 2005 (Also in Annals of Research on Engineering Education, Winter 2006, Vol.2, No.1, http://www.areeonline.org ). Kossi, K.,J-P Njante, C.B. Watkins and Y. Andreopoulos, “Microscale Shock Interaction with Shock-Thickness Scale Vortex using Direct Simulation Monte Carlo,” AIAA Paper No. 4898, Proceedings of the 35th AIAA Fluid Dynamics Conference, Toronto Canada, 2005. Gu, K., C.B. Watkins and Y. Andreopoulos, “Shock/Nonlinear Wave Interaction,” AIAA Paper 2006-3548, Proceedings of 36th AIAA Fluid Dynamics Conference, San Francisco, California, June 2006. Gu, K., C. B. Watkins, K. Kossi, and Y. Andreopoulos, “DSMC simulations of shock interaction with harmonic fluctuations,” in Proceedings of 25th International Symposium on Rarefied Gas Dynamics, St. Petersburg, Russia, 21–28 July 2006, edited by M. S. Ivanov and A. K. Rebrov, Siberian Branch of the Russian Academy of Sciences, Novosibirsk (2007). Andreopoulos, Y., C. Watkins, L. Bravo and A. Elzawawy, “Compressibility and Density Effects in Free Subsonic Jet Flows: Three Dimensional PIV Measurements of Turbulence,” AIAA-2007-3858, Proceedings of 36th AIAA Fluid Dynamics Conference, Miami, Florida, June 2007. Zoghi-Moghadam, M., A. Sadegh, C. B. Watkins, and D. Dunlap, “Biodynamics Model for Operator Head Injury in Stand-Up Lift Trucks,” Computer Methods in Biomechanics and Biomedical Engineering, Volume 11, No. 4, 2008, pp 397-405. Kossi, K., Y. Andreopoulos, and C.B. Watkins, “Dynamics of Microscale Shock /Vortex Interaction,” Physics of Fluids, Vol. 20, December 2008. Gu, K., Watkins, C.B., and Koplik, J., “Atomistic Hybrid DSMC/NEMD Method for Nonequilibrium Multiscale Simulations,” Journal of Computational Physics, 229 (2010), pp. 1381-1400. Gu, K., Watkins, C.B., and Koplik, J., “Molecular Simulation of Equilibrium Liquid-vapor Interphase with Solid Substrate,” Fluid Phase Equilibria, Vol. 297, No.1 (2010), PP. 77-90. Gu, K., Watkins, C.B., and Koplik, J., “Multiscale Molecular Simulations of Argon Vapor Condensation onto a Cooled Substrate with Bulk Flow,” Physics of Fluids, Vol. 22, No. 11 (2010).